If Solar And Wind Are So Cheap, Why Are They Making Electricity So Expensive? | Watts Up With That? The way solar and wind were rolled out with such high subsidies massively distorted the price point that the developers got paid for an inferior product that required duplicate back up base load power that worked when the renewable wasn’t producing, which was about 2/3 the time or more. This was done with reckless abandon by many jurisdictions, promising developers a guaranteed pay back, which made the wholesale prices paid for the renewable electricity and the dedicated back up plants extremely high which resulted in such a high retail price. Ontario is a good case example of went so wrong so quickly with contracts going to provincial Liberal Gov’t insiders who then donated heavily back to the Liberal party who had bulldozed these renewable policies via legislation over the wishes of local communities. I can only imagine that it is much the same story everywhere and South Australia is another example of too much too quick… and then destroying their coal base load generating plants. Just bizarre. This is only the start of the problem, mainly being the intermittent nature of such low density electricity to begin with. You couldn’t have dreamt up such a conspiracy to rip off consumers as the way this was all done and now the consumers are on the hook for all this until the contracts expire. The ignorance on this issue is dominant….journalists, academics, and governing elites …all support the alarmist narrative. The general public has no chance, they can only believe. The damage done from implementing “Green Energy Act” is horrific. Shutting down coal, refurbishing old nukes that should have been decommissioned, investing in wind/solar parks along with the necessary conventional back-up and creating an almost daily requirement for excess “alternative” power to be sold to the spot market for a fraction. $Billions and $billions and $billions and $billions….A growing fiscal boondoggle of irresponsible spending unmatched in Ontario’s history. With the continued move to the Left, Canadians attempting to reconcile rhetoric with reality should search the meaning of “Newspeak”. Except here in Ontario we elected a semi-conservative government (actually still called the Progressive Conservatives, if you can believe it). I’m not a huge fan of the Ford brothers (the premier is the late Doug Ford’s brother), but I hope the PCs can remember why there were elected (i.e., to fix the crap the previous Liberal governments had made). BTW, did we ever find out what we got for the $7 billion deal with Samsung? For what it is worth the C.S. WIND CO. shut down in Windsor a few weeks ago.Acouple hundred jobs gone with the wind.Afew years ago a startup company from Michigan set up shop in west Windsor thanks to 1.5 million from MC Guinty under the green new deal ( or whatever it was called). They operated for a few months and then went back to Michigan with the money. When asked about this Mcguinty said they would certainly look into it. That was the end of it. Shameful. Yes, its amazing that the “smart” politicians (certainly not those dumb, uneducated conservatives) aided by a fully functioning and expert bureaucracy continually fall for scam after scam after sc…. 3) companies then kick back a portion to help you get re-elected. Repeat as needed until retirement to a fat taxpayer-funded pension and a job with the company. Alberta and Canada (with any luck) will have conservative governments by the end of the year. Maybe sanity will prevail. As with any Big Idea, there will be many who say they agree…until it hits them in the wallet. Examples like South Australia appear to be only a little bad. The reason that these even work a bit is because of interconnection with other jurisdictions that have a more stable grid. Without this leaching off of more intelligent neighbors, the whole house of cards would collapse. It seems all so much like Atlas Shrugged. Just like claims that California will be 100% renewable. This is only accomplished by using topping capacity from over the state line. Just cut them off and let reality begin. I completely agree. No more oil deliveries to the states that make these bold claims- and especially those ignorant enough to sue oil companies. Cut the electric as well wires and let the demonstration begin. For that will be the best opportunity to end the charades, by letting people live through unreliables while the rest watch and learn from the INEVITABLE FAILURE and the howls from taxpayers finally living the truth. Nice thought, but the trouble w/that is the hoards would then come raging across the borders looting, killing and destroying everything in their wake. The neighbouring States are in no way more intelligent. Victoria allowed South Australia intermittents to destroy the economics of power supply in Victoria. The wholesale price in Victoria is now locked to the price in South Australia. It has increased 50% since 2016. The New South Wales government is almost certain to fund a much higher capacity interconnector to South Australia so it too can take advantage of the low cost intermittent supply from wind generators in South Australia. Once that is done they will shut down their oldest coal plant, which will increase their wholesale price by 50%. Then they will also need additional charges to recover the cost of the new interconnector. All Australian States have ambitions to get to 45 or 50% market share for wholesale electricity from intermittents by 2030. There is nothing intelligent about the plans. It guarantees Australia will surpass Denmark as having the most expensive electricity in the developed world. Anyone who owns a roof in Australia should be taking advantage of the government sponsored largesse to install the maximum amount of solar panels technically permitted. That will accelerate the economic demise of the grid as well as being financially rewarding for those who are able to make their own. enough natural gas over 30 years to generate over 300 million kWh…. Note: It’s not complicated, wind & solar are worth-less-than-nothing. A horrible waste of limited capital resources. The proliferation of this junk needs to stop now. Even if the author’s estimates are too high for natural gas it’s certainly at least 3X more cost effective. An estimate of 30 years of operation for wind or solar is pure fantasy. Both wind and solar last a maximum of 20 years. Most are scrap in 17 years or less. When you calculate the fact that the nameplate lifespan and the nameplate electricity production are overstated by 100%, then the true cost of wind and solar generated electricity is astronomically high. Utilities have to pay high market prices for new renewables instead of being able to “buy low” on the wholesale market. Because all utilities face the same regulation, they pass these costs on to end users. Here in California, as part of PG&E’s bankruptcy, many of the wind and solar investors may well be joining PG&E in bankruptcy as the renewable contracts are “re-negotiated”. The whole fiasco could have been avoided by simply not mandating renewables. Crazy. Not exactly. Renewable Portfolio Standards requirements vary from state to state. Some states have no RPS. I keep seeing this twerp credited for this “prediction”. Anyone who knew anything about electrical power production was explaining this to anyone who would listen years before that. He didn’t predict anything that any accountant at any power utility could have told you. So you are comparing an opinion with a published study? And concluding they have the same value? If it’s a widely-held opinion with decades of experience and evidence to back it up? “Published study” means almost nothing nowadays. Just look at mark jacobson’s study – US can reach 100% renewables by 2050. Do you really need a study to tell you what everyone already knows? The sun rises in the East and sets in the West, you don’t need a study to tell you that. Does the lack of a study somehow make it untrue? And being a “publish study” doesn’t mean much when seven journals were willing to publish a study that included a chapter of mein kampf with added feminist buzzwords amongst other nonsense studies that included the requisite kowtowing to certain left-wing ideologies. You don’t need a weatherman to tell you which way the wind is blowin’. Same outcome, same value … KNOWLEDGE IS VALUE. “Proof” of knowledge is also valuable, but it can be a way less efficient way to get where you are going. And in this case it is/was/will be. Maybe because it was so obvious, anyone w/reasonable energy-supply knowledge thought it unnecessary to put out a “published study”. I predicted it on these pages many years ago. I pointed out that intermittent renewables require backup, and the fixed cost of the backup never goes away. The greater the penetration of intermittent renewables, the more difficult it becomes to financially justify backup. I said that maximum penetration would be about 30%. Intermittent renewables can never be anything more than supplemental supply. Hopefully the author will do an update. Yes, he has some interesting recent articles advocating nuclear. By analogy, let’s consider your car. Does it get better fuel economy in stop and go traffic in the city at an average of 20 k/hr? Or on the highway at 120 k/hr? Despite encountering several times as much energy loss per km due to air friction and other losses, your car gets better fuel economy on the highway, because it is being run at a reasonably steady state. Wind mills and solar panels could be free. They still need to be paired with a conventional power source to fill in for their stop and go nature. The conventional source is cheap to run at a reasonably steady state like your car does on the highway. But tell it to start ramping from nothing to full power and back again on every whim of wind and clouds, and its like running your car on the highway, alternating between flooring it to 120 k/hr and then slamming on the brakes back down to zero, over and over again. The result would be fuel economy that makes stop and go traffic at an average of 20k/hr look pretty darn good. Which is exactly what happens to the cost of electricity from conventional sources when you introduce highly variable sources, even if they were free. Great description David, thanks for that. It’s an explanation a layman like me can use to help other laymen understand what’s going on. Many more of these examples are necessary to decipher climate science, which is difficult for a non scientist to explain to others. I keep trying to tell people, it’s laymen we need to persuade that CC is natural because the world is 90% laymen who have no grasp of science whatsoever. They also have 90% of the votes and it’s those we need to kick the climate shysters out of government. Additional cost factor is that when a utility loses a portion of renewable energy they often need to buy from other utilities. That purchase is like an auction. The highest bidder gets that valuable electricity. Often it sells for 100 times the production price and many times can go to 1,000 times the price. The utility I recently retired from has added a whole department just to buy purchase electricity as a result of shutting down a 500 MW nuclear power plant and replacing with 500MW from wind turbines. Additionally, since the shutter of the NPP, our residential rate has gone up 5% Evey year for the last 5 years. While your analogy between cars and wind turbines may have some merit, it has holes when you attempt to quantify “efficiency”. For autos it is usually a ratio of distance traveled per quantity of fuel consumed (eg. miles per gallon, mpg). For wind turbines the efficiency is measured by the ratio of how much mechanical energy can be extracted from the available wind’s energy. I’ll leave out the generator conversion efficiency which further detracts form the wind system. An auto idling will have very low fuel consumption versus an auto traveling at highway speeds, but because the auto is not moving it’s efficiency will be zero because no distance is being traversed. An auto travelling at highway speeds will burn fuel at a higher rate than idle, but it will be covering a far greater distance and therefore have a better efficiency. There is probably an optimum “sweet spot” for each auto to travel at which allows the engine to be performing at best RPM (for power output) and provides good velocity of the auto. For wind turbines the Betz limit (optimum energy extraction) is about 60%. This is because the wind turbine if it extracted all the energy from the wind would stop the wind and therefore would stop itself. Therefore some wind must continue to flow to keep the blades turning. This is what yields the 60% limit of energy extraction. It has been stated here before in the comments regarding wind. This sort of Analysis is deeply flawed using a fiscal-monetary unit to compare energy generation, Primary Energy sources is Absurd. The Proper comparison is Energy Cost of Energy ECOE or Energy Returned on Energy Invested. These measures allow one to see the amount of Surplus energy available over and above the energy input cost and this allows one to then make decisions on the best application of surplus energy for Wealth creation ( Prosperity). At a Policy Level and the level of political economy, of course, energy Taxation and Energy Subsidy screens the real questions of what the true social and commercial costs of the options are. Markets are distorted at all levels and Geographic scales by, Taxes, Subsidies and tariffs but equally at all levels by the availability of debt and Credit to business and individuals at all levels. Large Banking Interests and Corporate business interests manipulate Consumers in the Same way and in fact just as profoundly as Governments manipulate, CItizens/Subjects. As we are presently seeing a Fascist/Stalinist assault on Liberty through the Green New Deal and the Al-Gore/Sheldon Washington War on CO2 Collective what is the real focus of the overarching Agenda? In Europe Mogerini the EU MInister for War referred in a Speech Last week To The New World Order project, She does this habitually now, other less bold would be commissars of the New Stalinist/Fascist COmpact still cling to Rules based international Order. The Modern Monetary Theory ( Stalinist/Fascists) are really pushing their poison and they mean to Cull the Human Race with their misanthropic elitist dogmas. All Hail Ehrlich and the Mann/Hansen/Schmidt disciples of Agenda21/30. Liberty Loving Human beings are under attack, make no mistake it is an attack on several fronts and all patriotic, family-loving god fearing and right-minded people must understand we need a resolution to our own Byzantine Generals dilemma. Articles such as this only serve to muddy the waters, Large FInance Capital and Big Corporations and the State are all one and the same subsidiaries of the Oligarchy. And guess what The Oligarchy isn’t really into us unless it is stealing the sweat off our brows or exploiting our nearest and dearest to satisfy its own depravity. Piers Corby and Mark WIndows discussing the Green New Deal, Extinction Rebellion and the NGO sockpuppet complex. Was there a post on ” political economy” that I missed, and that you intended this comment for? The Climate Religion is a Political Economy Issue, If one wishes to engage in combatting the CLimate Religion Agenda then the issues I raise are key. Further, if we wish to be thoroughgoing in our scientific analysis then this should apply to our critique of the Renewables Gravy Train, Prosperity is a surplus energy question nothing to do with the Dismal Sciences own religious liturgies. dumbing down that does nothing to advance Liberty and Prosperity. It’s even worse. Price of kWh and bill value are two different things. 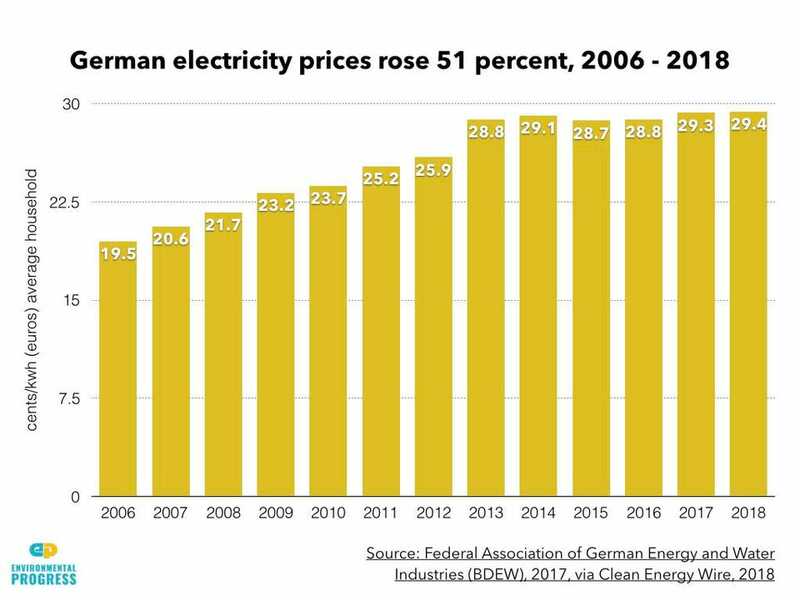 Result, between 2009 and 2018, the German utility bills value has close to TRIPLED, industrial sector inclusive even if about anyone has tried to reduce their consumption. Worse, look at the annual report for your local electric utility. There you will find a number for City, Municipal, County, State and Federal TAXES. Electric utilities are PROPERTY heavy – Buildings, equipment trucks, cars, Line maintenance equipment, poles, transmission towers, etc. etc. Of the 5 or 6 I have looked at the average is over 40% of the total liabilities. That means that 40% of that cost per kWh is TAXES. and then in many states they state adds a SALES TAX on that bill. so there is another 7%. Here in N. California, we are charged energy rates in ‘tiers’. As you use more energy (above the prescribed subsistence – read: 3rd world- level) … you move to higher tiers with higher rates. Why? PUNISHMENT. Economic Punishment. A disincentive to USE the product the Utility is PAID to PRODUCE. Why? The FARCE of “Global Warming”. We are being PUNISHED for consuming energy. Where do these windfall PROFITS get spent by the Utility? Advertising. Advertising telling us how “green” and “caring” PG+E is. Advertising humiliating us to to STOP “hogging” energy. WHY have we allowed this to become the policy, narrative, and economic strategy for our Energy use? I don’t WASTE energy. I have a NEST “smart” thermostat. My insulation levels are at or above standard. My house is “warmed” to a balmy 64 deg.F. … yet I am getting RAPED by my Public MONOPOLY Utility. Green Energy costs MORE … because THAT is the “green” economic GOAL. To FORCE the population to CONSERVE, not CONSUME energy. To LIMIT energy use, and generation. Eventually, the public will be so inured to this policy that they’ll simply shrug-off the brownouts and blackouts as … doing their civic duty to SUFFER. SUFFER just like all those poor-poor 3rd worlder’s who we are “KILLING with every click of our thermostat dial”. Yes, this is called Marxism. And we’ve passively allowed it to rule our very existence. Sorry to inform you but your CA GOVERNMENT controls those rates and the rate structure. It is called distribution of wealth. The Public Utility Commission is responsible for ensuring that NO Utility makes more than 5% profit. The PUC even reviews the accounting books of the utility. If the Utilities were making windfall profit they would get their rates DECREASED and the customers given a rebate. Also, I hope you realize that even an amateur can make more than 5% profit in the stock/bond market. [I am no wizard and my return over the last 40 years was in excess of 12%. was 16& till Obama got in office. ] The Socialist state of CA is aware of and approves this program to help Distribute the wealth. In every state I have lived in other than CA, the rate decreases as you use more. [MODS] Interesting article, how about fixing the missing graphics ? I have a different take on this – ‘clean energy’ legislation is the real culprit. Here in Australia, we got stuck with the innocuous-sounding Large Scale Renewable Energy Target (LRET) legislation, which I believe originated in Europe in the early 2000s. I believe the UK and EU have virtually the same legislation, except for minor terminology changes. 3. It provides a massive ‘subsidy’ (currently about 100% of the wholesale market price ) to the renewables generators via a clever system of issuing free ‘clean energy certificates – one per MWH sent to the grid – which the renewables generators can sell on a closed ‘market’ to electricity retailers and large wholesale purchasers of electricity, on pain of a A$65 per MWH penalty to the buyer. Current annual sales of these certificates amounts to almost A$2 billion! 4. The electricity retailers pass the cost of these certificates on to retail consumers as higher electricity prices (but strangely this ‘tax’ does not appear on our electricity bills – i.e. the RET is a secret tax on consumers paying for a secret subsidy to renewables generators). Now the effect of this scheme is massive and manifold (but completely unacknowledged by our politicians, media and ‘energy experts’ ) – to hugely encourage investment in renewables (who wouldn’t with a 100% government guaranteed subsidy! ), to artificially lower the wholesale price of electricity (renewables have priority for sales in this market at any price up to the 20% limit) and with a 100% subsidy can sell for $0 / MWH and still make good profits, to force base-load power generators to reduce their output in peak ‘renewables output’ periods, lowering their profitability even more, and finally increasing the retail price of power to poor retail consumers like me. This is what is really happening with renewables vs fossil-fuel power generation prices in Australia, but you wouldn’t know because it never gets reported. I would check to see if legislation like this is distorting your electricity market, and yell like hell about it. One of the key components of any system is reliability. The energy industry is a classic example of this fundamental driver of cost. Up to the time we discovered Mann Made Climate change or AGW in those days, the energy industry was very reliable. If you bought a plant that had a rating plate of 1MWhr continuous output on it, you knew what you were buying. Now this might explain the issue of why more renewables installed, equates to ever increasing energy cost. For every MW of intermittent renewable power loaded onto the grid, a back up of reliable supply must exist. If the return performance of wind is just 23% the grid will always need virtually 100% non renewable i.e. nuclear of fossil fuel generators, plus 4 times that average load of renewable installed as the Greens seek their 100% renewables objective. No system I know of, gets cheaper as more and more non performing equipment gets added into the plant. It is now clear from the wind farms already operating. There will always be 75% or the renewable capacity underutilised. That is where the added cost driver is. Lets not even talk about maintenance costs. A large proportion of German electricity cost is tax. Of the remainder, the part which goes towards green subsidies has actually recently been cut. These cherry picked examples of the pioneers of renewables don’t reflect the current and emerging position. and of course this isn’t about cost: it is about reducing CO2, because that damages the environment and ultimately world economies. griff, if reducing CO2 was the overall objective why don’t the Greens take the obvious option, which is insist on nuclear generation plants? Germany is the energy equivalent of Rainman without an aptitude for numbers. Actually it’s about 59 percent nitrogen, 21 percent hydrogen, 9 percent carbon dioxide, 7 percent methane and 4 percent oxygen. Griff… The taxes are paying for Energiewende and they won’t go away… unless Germany ditches wind, solar & unicorns. There is not one single, credible, scientifically acceptable, empirical study that demonstrates atmospheric CO2 causes the planet to warm. Regurgitate the Berkeley study and I’ll show you, once again, why it is neither credible nor scientifically acceptable. If wind power is so cheap why isn’t Africa covered in turbines instead of 150 coal fired power stations proposed for the country. You really need to stop believing the MSM. It’s all nonsense. New figures presented at Australian Energy Week suggested the new system, which is powered by wind turbines, has reduced the price of expensive power outages by 90 per cent. Anything other than wind, solar & unicorns would have avoided the “expensive power outages by” by >99.9% and saved money. Even with Australia’s high natural gas prices, combined cycle natural gas is much cheaper than wind & solar, if you factor in the storage costs. CCGT = combined cycle gas turbine. OCGT = gas turbines used to back up solar & wind. CO2 does not damage the environment. Depends if CO2 is still in it’s compressed cylinder. The reason power prices have gone up were nations have subsidised roof top solar panels, is greed and nothing more . Houses that have solar on their roofs are mainly vacant during the day while the sun shines and the power generated goes straight to the grid and they buy the free electricity they generated back at night , if they had solar and wind generators charging batteries during the day, they would be ready to go when they got home. Power companies need to maintain a growing bottom line to bring in more shareholders and keep the ones they have happy, People with solar on their roof git a cut in their bill while people without solar pay more and take up the slack . One of the biggest MONOPOLIES on the planet is electric power generation. Who here thinks coal and gas are just going to roll over and give up their monopoly????? Competition is what causes any industry to produce what we need at the lowest cost. Yet many if not all solar and wind sources are shielded from competition almost entirely and most of the cost they impose on electricity grids are not assigned to them thus making them appear much cheaper than they truly are. First, they are highly subsidized with your taxes thus much of their cost is hidden from consumers. Assign the subsidy cost to your electricity bill and their apparent low cost would be higher. Second, in most (and perhaps all) jurisdictions electricity from solar and wind must be accepted by the grid operators before any other source of electricity. Therefore as the irregular power from of solar and wind increases the power of dispatchable backup variable sources must increase. The cost of ever increasing backup sources is not assigned as part of the cost of solar and wind as it should be. Third, as the amount of irregular solar and wind energy on the grid increases (all of it mandated by rule to be accepted first) the unpredictable dips in electricity become larger and larger and eventually force base load sources to decrease their output. There is little or no change in the cost to operate baseload plants under this situation therefore their cost per unit of electricity delivered increases sometimes to the point where they must be shutdown. This is not a consequence of the the technologies involved but instead the rules under which they must operate. Forth, in many jurisdictions rooftop solar energy not used by the owner of the rooftop must be accepted by the grid (first of course) and the owner of the rooftop must be paid the full retail price for what they dump on the grid, not the much lower wholesale price. The cost of this very expensive and very irregular source must be paid by other users of the grid. Solar and wind companies have worked closely with politicians to develop a complex system of regulations and subsidies to compel construction of solar and wind sources and make the cost of such energy appear cheap. But as Warren Buffet has noted, the only reason to invest in such machines is the subsidies and regulations. Do away with the them and require solar and wind project owners to pay for the costs they impose on the grid and such projects would shut down. The only reason for solar and wind projects is to reduce CO2 emissions yet it is not clear that they even do that considering the CO2 emissions from their manufacture, the increasing CO2 emissions from most backup sources, and the increased CO2 emissions caused by closure of baseload plants. The reason why wind and solar push up the price has to do with the distribution of energy from them. Even if the wind turbines and solar panel themselves drops in price, the roads, maintenance the distribution net, etc etc do not. On the contrary, they increase the more plants you have and the more remote they get. Excisiting net cannot handle it. Anything at all to do with the BAD deals governments are doing with the snake oil salesmen selling their smoke and mirror energy as they try to hide the subsidies deeper and deeper? Other than that, as bare faced lying became the norm for the climate cultists should we consider the claims for what they are, diametrically opposite to reality? Follow the money. Cui bono? Why does Texas have the highest US installed wind capacity, see Here1 and Here2, yet also have the 6th lowest retail price? Thank you for the reply, and yes it did answer my question. And a thanks to Willis Eschenbach for spending the time to research Texas wind power. The reason for Texas’ cheaper electricity prices is the 75% decline in the price of natural gas. Before deregulation and the natural gas price drop, Texas was on its way to permanently high electricity prices. As a Texas, I thank goodness for fracking. Interesting report. Still, it seems all arguments here are skidding off the point. Of course “unreliability” is an obvious target (Germany even has a new word – AC and DC replaced with Fidget Current – Zappelstrom). And as usual never, ever let an accountant anywhere near strategic decision making. Notice the observation that “green” generators need backup from “traditional” generation? What is the difference ? Energy density! So low energy-density sources need backup from high energy-density sources. The highest energy density currently being nuclear, with fusion on the table. Germany being highly industrialized notices this reality. There is a direct principled physical economic reason for this. Economic growth, progress, is basically energy-density per-capita, per hectare. And a direct relation to relative potential population density. Which is why often in this controversy “population” suddenly hits the radars. Knowing this why wait for it to “accidently” appear – go for the central argument : lowering energy density is only about population reduction – eugenics with green lipstick. The fundamentals of the cost of various electricity sources was well known to engineers when my employer got into the nuclear fuel cycle in 1972. Incoming energy density, intermittency, duck curves of another name, the maths of fossil and nuclear backup, spinnng reserve, frequency control- these were known with sufficient certainty to be used again today. As a sideline, we actually operated the oil fired plant that supplied all of the huge iron mines of the Pilbara, yielding operational figures. Latter day experts might find it more rewarding to research and explain why numerous successive legislations ignored the engineering knowledge and plunged into schemes that were known to be hopeless that 57 years ago in little Australia. Step right back from it – so far away all the minutiae of solar panels, nuclear, windmills, CO2 goes out of focus. What do you see – YMMV but I see one bunch of rats eating another. Is ANY Western Government NOT bankrupt? No. Ehrlich did not describe it in perfect detail and he never could, the Eaters would simply throw up a load of chaff to hide what they’re up to – exactly as they’re doing with Renewable Energy and in fact Climate Change in all its glory. Continue with big hugs and kisses to the Lehman Bros mwah – The Bank of England went on a money printing spree over the last decade – and it all finished up in the pockets of already rich people. What do quantitative easing, sexting and unfriending have in common? Millennials cannot afford houses now – so not only are the rats eating each other, they are eating their own and each others children. Did Ehrlich mention that? They seem really tasty, never better I’d say. What is the shiny stuff doing inside a Thermos Flask. Because if you thinking it is ‘reflecting heat’, think again. It would seem that every country that is aware of this potential money-making scheme would be encouraging their neighboring countries to build the heck out of solar and wind while only using coal in their own country. All we need to do is to convince politicians that they can line their pockets with the money paid for taking the excess electricity and pretty soon it will be a race to coal while spending some money on convincing the other countries to go renewable. The flaw is that the neighbouring countries will have little control on the excess power being dumped onto their grid and having to deal with the impact. Try Germany and Czech Republic for an example. They were annoyed at being the German grid’s load balancer. Denmark sends its excess to Norway who being mainly hydro are far better able to cope. I guess this must explain why Iowa (8.73), Kansas(10.6), Oklahoma(8.2), North Dakota(8.78), and South Dakota(10.05) all have electricity rates at or below the national average (10.48) [except Kansas which is 0.1 above] despite being ranked 1, 2, 3, and 4 in wind penetration. Or you could look at Texas which has the most wind installed by far and rates of 8.38. Massachusetts, Rhode Island, and Connecticut all have rates higher than California despite having little wind or solar. Also New York, New Jersey, Maine, Vermont, and New Hampshire have higher than average prices. What ties the high rates together is not renewable or fossil fuel usage, it is ridiculous regulations. Yes, over-regulated states also tend to demand “green” energy, but the cause of the high prices is probably more due to the regulatory environment than the fuel of choice. Not for long, in Iowa, at least if you’re a customer of Alliant Energy. 25% increase they’re asking for, to build more windmills. Which would then raise Iowa to the national average. However, notice that they are asking for a rate increase. This is an over-regulated market where Alliant has a feducial obligation to generate as much profit as possible for shareholders. The only way to do that is to install new capital equipment which is priced to generate a guaranteed rate of return. Remove that guarantee and things will become more rational. The huge drop in natural gas prices due to fracking is the cause of the cheaper prices in the states you cited with significant wind generation. North Dakota, South Dakota and Iowa have the Bakken formation which produces huge amounts of natural gas locally. The same with Texas, Oklahoma and Kansas. Kansas had nearly 100K oil and gas wells in 2016. Without a 75% drop in natural gas prices, the price of electricity in those states would be much higher. Wind did not reduce the prices of electricity in any way. So they are closing the power plants that are the perfect compliments to the Renewables; Nuclear Generators. Nuclear plants are ideal for being used as load followers, they have quick reaction times and can idle very effectively. What confuses many is that Nuclear Plants have typically been used as base loads, this is due to the economics of not having to refuel, etc. but if Solar and Wind take over the base load, then Nuclear Plants can be switched over to load following. But of course the Greenies will never let this happen. If you want a thousand dollar a month power bill in the winter months, switch to wind and solar. That’s what happened in Ontario and people couldn’t afford it so they don’t have power anymore. They’ve been sent back into the 1700’s as have many people around the world which has led to fewer people now having electricity than there used to be. As governments start to run out of money subsidizing these wind and solar scams the burden gets shifted to the consumer, many who can’t afford the price as well, so they don’t have power anymore. Often when something fails it doesn’t do so because of just one flaw. Renewables are non-dispatchable, yes. They consume network resources that they aren’t required to pay for–although that scam may be just about over. There is also not enough savings available to go on these proposed crash programs to replace the present system with renewables in a decade or two, or even three. The crash program can only happen in three decades if we allow renewables to crowd out all sorts of other tasks. Then another flaw rarely spoken of is that renewables contain a great deal of embedded energy. I once calculated that wind turbines contain a couple years worth of their energy production in all the steel, concrete, and specialty materials they contain. And that is without considering battery storage. Then people speak of renewables as providing lots of high paying jobs. Well a person can’t propose lots of high priced labor and expect to lower costs at the same time can they? And what if renewables do cause the price of electricity to increase three or more times, and we have to begin making all the energy intensive materials for renewables out of renewables? What will happen to costs then? Finally, at their present scale of installation, they are not quite an ecological disaster (views, birds, bats…) but what about at ten times the present scale? Author failed to mention (or I failed to notice his mention) that someone has to pay the extra cost for adding a parallel system that is completely unnecessary. I live in Illinois. Our prices are high. Not counting existing taxes and with a governor looking for sins to tax even more. So, the author is saying it will be worse, then? The only thing the author didn’t note was the correlation between less coal and higher prices. Our experience is that the fix that is in for wind has made it impossible for competitors to sell their product on the grid except in a back-up role. So, we have and will experience even higher prices and will separately be forced to subsidize wind’s competitors. To illustrate, the Clinton nuclear power plant is surrounded by wind fields (Bloomington, Normal, Maroa and in the process of building one in Clinton itself (with credits paid by us)) producing a fraction of the capacity of the nuke while the State is forced to subsidize that nuke. so it can be available. When given the choice on least cost, low bidder, policy choices the lobbyists for the high cost choices won out most of the time with the green deciders. That’s why you have statements and claims by the solar associations touting jobs in an otherwise labor saving sector where low bidder utility scale projects are one fourth the cost per watt LCOE of rooftop solar. Where else in the energy sector do you have such disparity of price and cost other than a few special, insignificant situations. Throw in anti-competitive local content rules in Ontario, India, and others and you have policy-driven cost escalation and lost-cost producers exiting the artificial economy. Windmills and industrial solar can’t do the job of powering the world by themselves. They need sufficient backup to supply 100 percent of electricity requirements. If we need to build backups equal to the windmill and solar capacity, then what’s the point of using windmills and solar, we should just use the backups all the time. The birds and bats and other living things will thank us for it. No because they are not sustainable energy sources in that we are consuming them faster than they are being produced. We have a moral obligation to make our society more sustainable – a moral duty to future generations. We’re not morally obliged to shutdown our economy (aka The Green Raw Deal) for future generations but we are obliged, I believe, to try to become more sustainable insofar as we can. Sustainable is an elastic weasel word. It simply means population levels of the late stone age. Yes, and wait for the panic heads when the latte-sipping hipsters get that message – the hard wad. Preferably, through brown- and blackouts routed through their gentrified ‘nabes (or ‘hoods, or whatever they call them these days). Sorry, was editing this from “exploding heads”. bonbon – bizarre reply. I never touched on the issue of population levels and constantly challenge anyone who says that the world is overpopulated to give a scientific basis for such a statement – none have ever done so. We know what sustainable means and we also know we have a moral obligation to strive for it – regardless of population levels. What the ‘correct’ population level of the earth is I have no idea but am open to it being much less than the current level or much greater than it – demographics in a shrinking population are a time bomb and one that many Western countries are going to face in a real way in the coming decades. It is not bizarre – the Schumacher “Small is Beautiful” sustainable mantra means exactly that – stone-age population densities. Even arch de-carbonizer Dr. Schellnhuber CBE is quite clear about it – it means 1 billion population. When one hears from “The Elders” (recent post here at WUWT) – check founder Branson billionaire and their “global village” mantra. A sustainable global village of max. 1 billion in regional tribes. Our species has nothing to do with primates who never exceeded 10 million specimens. And the use of Carbon has a major part to play – fire. Notice the attempt to remove fire (and nuclear is fire) with the GND? Shades of Zeus attack on Prometheus. “Sustainable” means monkeying about with our species. And some think it’s only a word. No we do not have a Moral Obligation to make our society more sustainable. We have have the obligation to provide as much energy as cheaply as possible to provide food, clean water, medicine etc. When those finite energy supplies run out in a couple of hundred years we can shift exclusively to Nuclear. But the societies need to be technically advanced and rich to do so. You do not get there by handicapping your energy supply with Wind & Solar. Unreliable energy sources that require backup from hydrocarbon sources are not sustainable. Rather big misinterpretation if the idea is that the cause is wind and solar energy in the case of Denmark. Danish taxes on electricity are old and have their start with the oil crisis of 1979. High taxes generate an incentive to more efficient use of power which reduces energy needs and lower dependency of oil/coal imports. A major reason for higher energy prices due to installed wind and solar (at least here in the U.S.) is the regulatory structure. Electric utilities are guaranteed a return on investment by their state regulators because they are regulated as monopolies. So, if the regulators can be convinced that a solar installation in Minnesota makes sense to approve they will then also approve a revision to the rate structure that allows the utility to recover all the costs of the installation, plus a modest profit margin. Plus, when the regulators hear that the cost of solar and wind power installations are plunging, they’re inclined to approve adding them to the grid, especially if they’ve already approved more expensive solar/wind installations in the past. To do otherwise would be to admit the previous approvals were mistakes. In the end, due to the need for backup installations, the utilities need more capital equipment than they would need if they’d have avoided wind and solar altogether, but why should they care? They just earn a modest guaranteed profit on that higher level of capital equipment. In other words, the companies do better financially even as they’re forced to raise rates on their customers. The task is to educate the customers to create the equivalent of the French “yellow jackets.” The regulators and the utility companies are already fully aware of the fraud. They just have no incentive to care. I think the most powerful graph from a layman’s (i.e., a potential yellow jacket’s) standpoint is the one that shows that the price of electricity to the consumer is much higher in countries that have gone whole hog into solar and wind, and much lower in countries that have reliable base load power from fossil fuels and nuclear. Also, the stop/go analogy presented in the above comments by davidmhoffer would be easily understood by most consumers. In combination, those two points would make an excellent presentation to most consumers. First the facts (prices vary with installed wind and solar) and then the reason (the need for, and misuse of, backup power sources). I’m not advocating a replay of the French riots here, but angry consumers, if informed, can carry a lot of weight, especially if they start showing up in droves to regulatory hearings. It’s actually just a tad worse than that. The energy companies in regulated markets are always looking for ways to justify installing capital intense projects – that is the only way they can return dividends. If it were possible they would install equipment that will break in 5 years and reinstall the same junk just to pass on a rate hike. In other shocking news, water is wet. Every article I’ve read comparing the cost of solar and wind, with fossil fuels use something called “levelized costs”, which are not actual costs. The articles don’t actually acknowledge this, of course. But if you click on the paper or report cited, you will see that this is the case every time. What are levelized costs? They are whatever you want them to be. They are imaginary numbers made up to bolster the propaganda. How does this work? You take the actual costs of fossil fuels and add in X number billions of dollars of “estimated” costs related to damages caused by the evil CO2. Cherry picking data points and sources is always misleading. The relationship between price of electricity and percentage of renewables is far less clear than the author’s analysis indicates. Let’s just look at the United States, where there is tremendous variability in percentage of electricity generated by renewables as well as in utility rates, but all are under US Federal laws and regulations, and all 50 states have exactly the same general economic systems (regulated but largely free market capitalism). I used the 2017 data for electrical retail rates for all 50 states as well as the 2017 data for percentages of renewables, not including hydropower for all 50 states. I used cohorts to make differences more readily apparent, and so summarized data for the top 10 states for percent renewables, which ranged from 46.1% to 21.8% non-hydro renewables (including in order from highest to lowest, Maine, Vermont, Iowa, Kansas, Oklahoma, South Dakota, North Dakota, California, Minnesota, Idaho). And then I also summarized data from the 10 lowest renewables states from lowest to highest (Kentucky, Tennessee, Delaware, Ohio, West Virginia, Florida, Arkansas, Missouri, Alabama, Mississippi). I noted also the very wide variation in pricing within these two cohorts, resulting in Standard Deviation values of 2.57 in the top ten and 0.84 in the bottom ten. Another way to compare is by looking at the two very largest states in population, California and Texas, which have very different environmental laws, obviously. 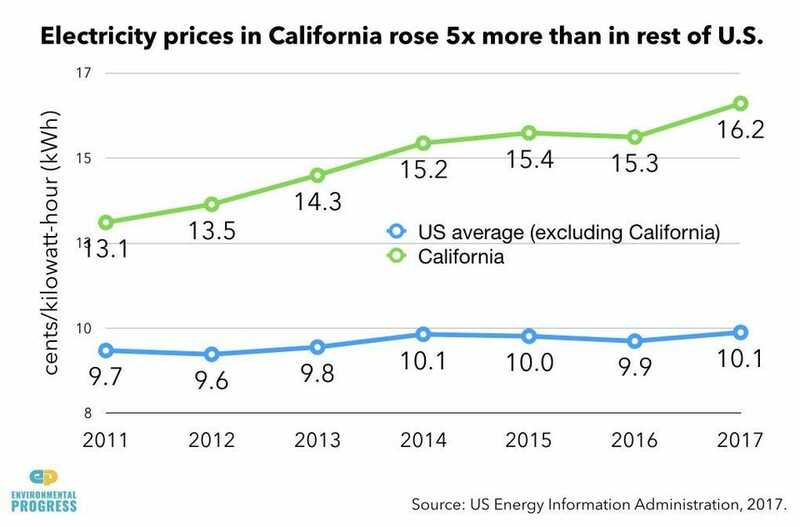 California has one of the higher electricity rates in the nation at 16.14 cents/kw-hr (8th highest), and one of the higher non-hydro renewables percentages at 26.5% (8th highest). While Texas, which does not fall into either the top ten or bottom ten renewables, at 15.6% is 14th highest in renewables, yet also has 8th lowest electricity rates at 8.56. Bottom line is that in general, the US states with the highest renewables percentages – which are rather high, actually, averaging over 32% – do pay slightly higher electricity rates than the states with the lowest renewables percentages … but still well within the standard deviation of the rates per their own cohort of renewable percentages. This comparison suggests that whether a state has high or low renewables percentages, the effect on electricity rates paid is rather small (less than 15% between highest and lowest cohorts), and that other factors – such as California’s very heavy air pollution regulatory scheme as compared to Texas’ very light air pollution regulatory scheme – seem to matter a lot more than do renewables percentages. A comparison between US states is also a much more “apples to apples” comparison than any comparison between nations that have entirely different governmental structures, tax rates, economies, and customs that make apples to apples a very difficult comparison to achieve. What happens when you compare electricity costs pre- renewables in those states with present costs ? I live in one of the “top” 10 states … consumer costs have risen more than 20% in the last few years . Right along with penetration from “cheap” wind and solar . And if it is anything like Ivanpah in the Mojave area, it will produce usable power from the sun around 50% of the time and require a Gas Powered backup to maintain the necessary heat at night. The 950 MW Concentrated Solar plant is really a 700MW Concentrated solar (1-100MW and 3-200MW) and a 250MW PV solar project to recharge the back up power system. In all likelihood the 15 hour back-up planned is because they have looked at Ivanpah and realize their scheme will produce usable power 9 – 12 hours per day. The current Solar PV measures 2 mi x 2.5 mi for 213 Mw with pland to develop up to 5000 Mw. 5000 Mw would take 20 times the space or about 100 square miles for PV. So, it hasn’t been built yet? That project doesn’t actually exist. Contrast that with Ivanpah which does actually exist per the terms of the contract it signed with the state of California, should have been closed and shuttered long ago. Because they only supply electricity intermittently. Therefore you must also invest in another source of reliable electricity for when the wind doesn’t blow and the sun doesn’t shine. So you could have simply produced electricity from that reliable source, and saved the investment in wind and solar. Example: South Australia just a few years ago had coal and gas generation and prices were $60/MWhr. SA now has 1900 MW nameplate wind generation with demand varying from 1000-2500 MW, backed up by gas and diesel generators. So duplicate investments, current wholesale price $116/MWhr. Yes, the cost comparison that matters compares what it would have been without renewables, with what it has become with renewables. In rough terms, Australia could be $40 a unit instead of $90. If only we had not changed to main producers in the mix. Nothing except ideology is preventing a return to the good times. You might think that is too gross, to general, to shallow, but after decades in the business I bet I can beat you down on any point you raise. Doers usually outrun believers in challenges like that. A second problem is the federal production tax credit of $23/MWh paid to wind generators, coupled with their priority access to the grid. When there is oversupply, wind output is taken preferentially. Capacity payments can offset losses to some extent, but where market prices are around $35-$40/MWh, nuclear plants are struggling. According to Exelon, the main operator of merchant plants and a strong supporter of competitive wholesale electricity markets, low prices due to gas competition are survivable, but the subsidized wind is not. In 2016 the subsidy (production tax credit) is $23/MWh. Though wind is a very small part of the supply, and is limited or unavailable most of the time, its effect on electricity prices and the viability of base-load generators “is huge”. in France the gilets jaunes protest because Macron wants to force his fellow citoyens by increased fuel prices to dispense with the use of ICE-powered vehicles that these fellow citoyens need to go to work. At the same time, he has to make energy consumption even more expensive in order to deliver this “cheaper, eco-friendly energy”.